As technological advancements change the landscape of our society, the civil process service industry has been faced with a number of challenges to traditional personal service, including e-service and service by social media. Despite this, it seems that the civil process service industry has managed to persevere. Now that the FAA recently established new rules for non-hobbyist Small Unmanned Aircraft (aka drones) in June 2016 — in effect lifting an ambiguous, decades-old ban on the commercial use of drones — it has become clear that drones will be a part of our normal technological landscape. And with that, comes the question of how the process service industry can take advantage of this technology and how it will be impacted by the capabilities of drones. Drones have the potential to replace droves of delivery jobs, from food delivery to packages — and potentially process service. Drones have already begun causing controversy when it comes to providing a competing package/letter delivery service to the US Post Office and other delivery services, like UPS and FedEx. Some companies, most notably Amazon, have already begun creating plans for how they will adopt drones as a means of delivery, which would thus eliminate the need for a third-party carrier. Although the Wall Street Journal reports that it would be a few years before we see package delivery drones flying in our airspace, the recent FAA ruling could be putting those plans on the fast track. If drones can carry and deliver packages to intended recipients, then the possibility of drones delivering court documents is a reality to consider as well. In situations similar to service by social media or email, where the recipient is expecting and willing to accept service, drones may become a legitimate means of service — and if delivery by drones become a widely accepted courier service, it could encroach on service effectuated by certified mail. E-service has made it clear technology can have an impact on process service, but in the same way that is only used as an alternate and not initial method of service, drones have the potential to be used as a secondary method when personal service can’t be completed. Perhaps down the road drones will have an automated set of questions where an appropriate response would alert the system the person is a member of household or managing agent and able to be served. Maybe they’ll be able to recognize an individual using the same type of technology Facebook and the FBI’s facial recognition programs do. Until that day comes it seems unlikely drones will have a huge impact on process service. It doesn’t mean process servers shouldn’t pay attention however. Just as some legislation has come up to move to postal service for certain collection matters due the cost, the same could happen with drones. Although it seems unlikely that it would significantly encroach on the business that process servers have, it could become a new, very real competitor. Ultimately, for process servers who are used to handling bulk service, such as those in the collections industry, the potential is there for drones to truly impact their business. However, the surveillance possibilities for drones are endless. Law enforcement agencies across the US have applied for FAA drone licenses, and some agencies, including Mesa County Sheriff’s Department in Colorado have been granted the permit, which means drones are currently being used by law enforcement agencies. According to the Mesa County Sheriff’s Department website, they are primarily using drones for crime scene photography, as well as search and rescue missions. For process servers and private investigators, this could help eliminate or reduce man-hours searching for evasive recipients. It could also verify skip traced addresses and remove process servers from potentially dangerous situations, such as dealing with recipients who are known to be hostile. Aside from the reality that the concept of drones seems like a far-fetched idea straight out of a sci-fi movie, companies intending to capitalize on using drones have run into problems with the FAA. There is a significant amount of risk and liability with introducing a new flying object into our airspace — not just for the materials it carries, but for the companies that use them and the people below. And that is just the physical aspect. Personal privacy also comes into question with the possibility of drones entering our airspace. When explaining some of the uses for drones, Tim Brenner also brought up the fact that a drone operator would need to be aware and “not invade the resident’s privacy if used.” Especially if the device is recording, as is becoming commonplace with service attempts, privacy laws could come into play. This capability would almost certainly need to be regulated in order to ensure that people’s personal rights wouldn’t be compromised. It seems as though the United States is beginning to accept commercial drones by taking cues from around the world, as a company in China has created and kicked off a drone delivery service. The Aussies are also considering jumping on the bandwagon to use drones as a means to deliver vital organs. It might just be that anything that needs to be delivered can be delivered by a drone. In fact, your next burrito might be delivered that way — no tip required. 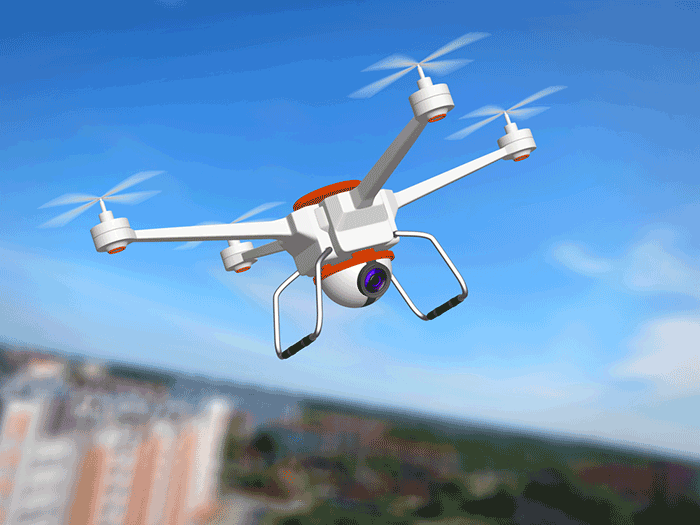 Although we have seen technological and social advancements create new methods of effectuating service in the past, it is unclear how drones specifically will ultimately affect the civil process service industry. As the industry changes, it’s better to stay ahead of challenges than to be left trying to react after it’s already impacted business. Of course, drones couldn’t affect process servers until they became a legally accepted means of service, which would require amendments to laws currently on the books regarding acceptable means of service. And as we all know, challenging or changing current laws isn’t always an expeditious and fruitful process. However, it’s certainly a reason to keep your eyes to the skies.